They scoff. They groan. They glower. They pout. They walk or run away. They sulk. These are some of the annoying ways children react to displeasure, anger or frustration with their circumstances. 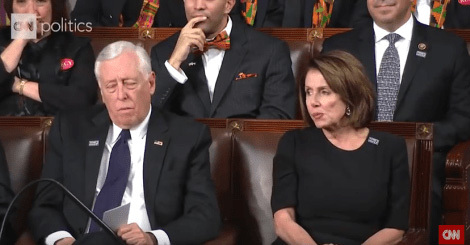 And this is exactly the way so many Congressional members responded Tuesday night to the President's State of the Union address. Their behavior was embarrassingly shameful. Whether children or adults, sulking is an expression of one's spirit. People pout because it's something that worked for them in the past. It's a means for getting their way. To give attention to it only makes it worse. Few things will better defeat the sulker than simply ignoring him or her. As our President spoke about the good things accomplished in our country, and as he spoke with words of conciliation, I couldn't help but think of the sullen spirit of Jonah when he was upset over the repentance of Ninevah. God said to him, "Doest thou well to be angry?" (Jonah 4:9). Gary Baur, head of the Campaign for Working Families said, "[President Trump] brought up our monuments, our national anthem, our values, that our liberty comes from God, etc., etc. – and shockingly, half of the room in virtually every case refused to applaud or refused to stand .... I think [it] was, as I said, shocking; and I also think it will be deeply damaging to them as the American people ponder that...It was a very sorry display of sort of surliness and anger that I don't think will play well with the average Americans of both parties," he said. "Sulking ignited with the kindling of frustrated desire, needs constant infusions of self-justification to stay alive. But once it blazes, you find to your horror that you no longer manage it; it manages you. This is because you had totally underestimated the spiritual dimension of sin..."
Pastor Al Hughes has said, "Sulking is more than a bad mood. It is a stronghold in the soul that must be cast down!" What we saw in our government representatives was reflective of the shallowness of so many Americans. We must be better. We must endeavor to be both spiritually and emotionally mature. And certainly, we need to see this modeled in our leaders.